An outdoor kitchen will become the heart of the home every summer - 4 Life Outdoor Inc. If you think the kitchen is the heart of the home, then consider bringing that space outdoors this summer. The options for an entertaining outdoor kitchen are endless — sinks, refrigerators, lighting, roofing and the list goes on. If this sounds appealing, then you are not alone. More than 70% of homeowners who have outdoor space are looking to enhance the patio with the goal of making it more relaxing. Here’s how you can bring the food and festivities outside! 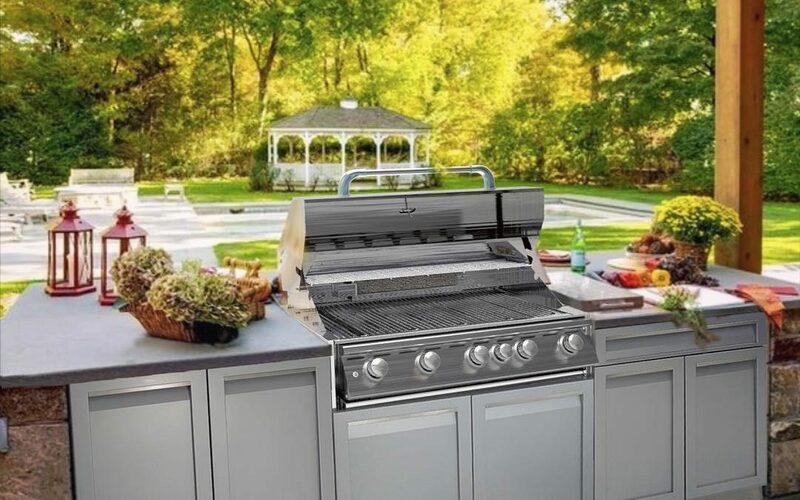 It’s very easy to fall in love with a grill, appliance and outdoor kitchen products. Research the appliances and outdoor options available and set a budget. Outdoor work can be done any time of the year, but above-freezing temps are preferred. The timeframe to complete an outdoor kitchen can range from 2-3 weeks to four months, depending on the complexity. Make sure to add up all the costs, things can get expensive once you factor all the options on your wish list. We would love to help you design your outdoor kitchen. But if you need stone work or landscaping start with a renovation company or landscapers. They can verify your budget and design; requirements for municipal permits including electrical, plumbing and gas requirements; assess existing decks as well as build any structures necessary for your vision. We can work with your landscaper to help them design and lay out your space. Consideration should be given to blending the outdoor kitchen into the overall look of your landscaped outdoor space. Your style preference and budget are considerations, but durability is key. Exterior materials will differ greatly from your indoor kitchen as they need to withstand winter cold, including pipes that drain easily for winterizing. Stucco, concrete and stacked stone, and stainless steel frames and cabinets are commonly used for structures that encompass countertop, storage and appliances. Ironically, not all fridges are designed to withstand the winter. Outdoor fridges must work harder to maintain a constant temperature when the weather fluctuates and a high-grade stainless steel model will reduce rusting. Shade and shelter from the rain comes in many forms and price points, from a budget-friendly retractable awning to a full gazebo roof wired for sound and TV. Have a long think about what you will use the area for. Will you be reading or playing games with friends? Then perhaps you need more lighting over the seating area, as well as where you prepare the food. Hosting dinner parties? Then consider more ambient lighting that highlights architecture. 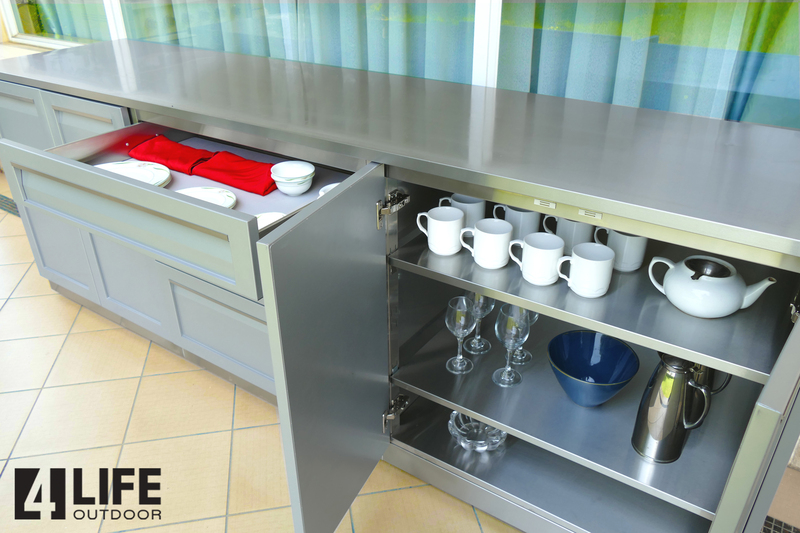 If you have many of these items already in place, and are looking for a perfect DIY solution, just place your favorite appliances into our stainless outdoor kitchen cabinets. It is an easy upgrade which can be completed in an afternoon! We look forward to hearing from you and your contractor.